The heroes of Only Fools and Horses are making a comeback in a musical version of the classic sitcom which is running at London's Theatre Royal Haymarket. It has been co-written by Paul Whitehouse and Jim Sullivan (son of the sitcom's creator John). The late Chas Hodges, of Chas and Dave fame, helped compose the show's 20 new tunes. The musical (which John Sullivan was working on at the time of his death in 2011) is "fully endorsed" by the late writer's estate. The show will be directed by Caroline Jay Ranger. Tickets are on sale now. Fast Show legend Paul Whitehouse is playing Grandad in the revival, with Tom Bennett (David Brent: Life on the Road) as wheeler-dealer Del Boy Trotter and Ryan Hutton (I Am Vengeance) as his hapless younger brother Rodney. Dianne Pilkington is playing Raquel with Pippa Duffy as Cassandra, Jeff Nicholson/Boycie, Samantha Seager/Marlene, Peter Baker/Trigger and Adrian Irvine as Denzil with Pete Gallagher/Danny Driscoll – Featured Ensemble, Adam Venus/Tony Driscoll – Featured Ensemble, Chris Keily/Mickey Pearce – Featured Ensemble, Oscar Conlon-Morrey/Dating Agent – Featured Ensemble, Melanie Marshall/Mrs Obuko/Wedding Fitter – Featured Ensemble, Andy Mace/Mike the Barman – Featured Ensemble , Chris Bennett/Sid/Featured Ensemble. They will be joined by ensemble members Lee Van Geleen, Lisa Bridge, Andrew Bryant and swings Samantha Lane and Bradley John. (There is no Uncle Albert, as he did not appear in the series until the departure of Grandad. Featuring material from the TV series ,the musical takes a a trip back to 1989, where it's all kicking off in Peckham. While the yuppie invasion of London is in full swing, love is in the air as Del Boy sets out on the rocky road to find his soul mate, Rodney and Cassandra prepare to say 'I do', and even Trigger is gearing up for a date (with a person!). Meanwhile, Boycie and Marlene give parenthood one final shot and Grandad takes stock of his life and decides the time has finally arrived to get his piles sorted! 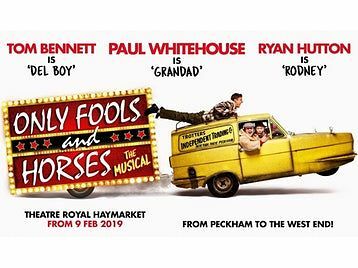 Buy tickets for Only Fools and Horses Musical which is booking to 28th September 2019. Guide dogs are permitted inside the auditorium or they can be looked after in the manager's office. No steps to the auditorium through exit doors to the left and right hand side of main entrance. 1 space for a wheelchair user at X18. Transfer seating available to any aisle seat for 1 scooter and 4 wheelchairs. There is no adapted toilet. There is one private toilet at the stage door on Suffolk Place but access to this is up 3 steps.